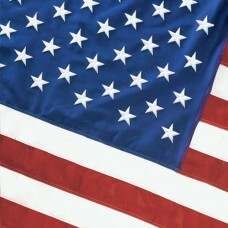 We offer three high quality choices in outdoor American Flags, all having embroidered stars and sewn striped. 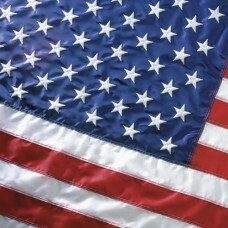 Our heavy-weight nylon flags are the most versatile fabric which combines strength and brilliant appearance. 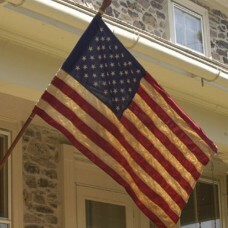 Our polyester flags are made of 100% polyester 2x2 ply construction and are ideal for extreme weather conditions. Our cotton flags are made of 2x2 ply mercerized cotton and are a great looking traditional flag which is ideal for special flag flying holidays. 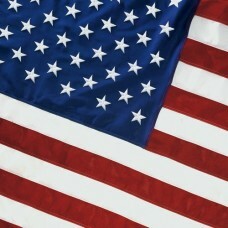 Our flags are manufactured in the United States to exacting specifications, under strict quality control. and are designed and constructed to endure the sun, cold, and rain. Lightweight in construction, our material is designed to wave freely, and high in tensile strength to withstand wind and harsh weather conditions. We carry outdoor American flags in the following sizes: 2 1/2' x 4', 2' x 3', 3' x 5', 4' x 6', 5' x 8', 6' x 10', 8' x 12', 10' x 15', 12' x 18', and 15' x 25'.